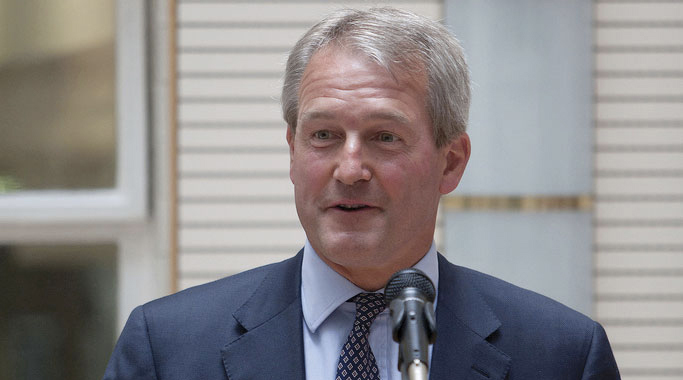 Farmers in the UK would benefit leaving the European Union, according to former Defra minister Owen Paterson, as they would be free from EU directives and subsidy policies. Paterson said money could be better used in a targeted and efficient manner. "I believe that the United Kingdom has a great future beyond the political arrangements of the European Union," Paterson said at the Oxford Farming Conference. "Agriculture and food production is hampered by our membership of the Common Agricultural Policy. CAP negotiations between 28 countries inevitably mean that we have to accept compromises, these are at best deeply unsatisfactory and at worst actively damaging to UK farmers." Earlier this week, NFU President insisted that the referedum could completely change the way agriculture operates. Shadow Defra secretary Kerry McCarthy voiced concerns that the only reason the UK wants to stay in the EU was due to "jobs and investment" rather than real issues in farming, the environment and animal welfare. Ms McCarthy criticised the Environment Secretary's stance: “It is very narrowly focused – I think we need to look at the Defra side of it far more. I agree that there ought to be a team within the department looking at it. If people were to make an informed decision, then that work needed to be done." Andrew McCornick, NFU Scotland Vice President commented: “Put simply, the interests of agriculture in Europe are clear – farmers would prefer to farm without the financial support they receive from the EU, but the reality is that most farms don’t make enough from the market for this to be possible. “The role of direct support in overall Scottish farm incomes is complex but invaluable. Any drop in, or removal of, direct support could lead to a significant number of Scottish farm businesses hitting barriers and will remove the ‘multiplier’ effect of the farmers’ pound, to the detriment of the food sector and the wider rural economy. “A further issue is access to the European single market, which allows tariff-free trade amongst all member states. The EU’s negotiating position has also allowed trade agreements to be opened with some 50 international partners in recent years. This is of great importance to Scotland’s food and drink industry, which continues to exceed targets and had an export value of £5.1 billion in 2014. “Whilst issues within domestic supply chains are currently hindering primary producers’ ability to receive an equitable share of the retail price, it is vital we continue to build on the prominence of Scottish food and drink in key export markets both in and outside of the EU, and indeed enhance trade with our neighbours in the rest of the UK. “For farmers to vote to leave the European Union, they need to know what the trading arrangements with the rest of Europe would be – would Scotland be able to continue to trade tariff-free with Europe or would our lamb, beef and other key farm exports face a tariff barrier? Would access to important overseas markets remain or would the UK have to start over again in negotiations? Lang said: “Food and agriculture are central elements in the EU structure, yet they have barely been raised in the Brexit debate so far. Big food companies are nervous about supply chains being destabilised, while farmers and growers are worried about how their exports may be affected.